This was a fun evening spent catching up with Pat and Doreen over dinner followed by socializing with co-workers and close friends. Instruction about what to expect in the next four days by Pat filled the rest of the evening. If you experience a roadblock in a horse’s training the solution is in the basics. Go back to the training basics and a solution will be found. 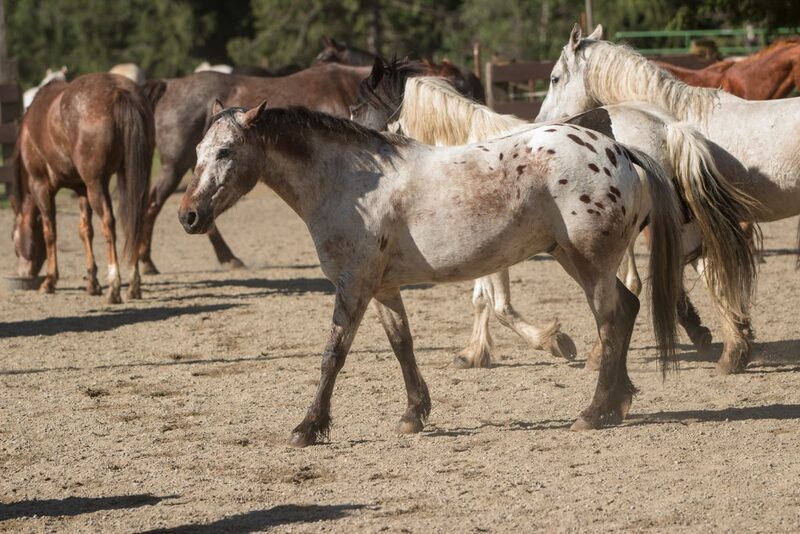 My little-spotted horse was a dear (most of) the day. A little background: Zeus and I have an intense love-hate relationship. Some days he is a darling who is super fun to ride and quite the character. It is my hope that through this clinic I will find some purpose, some focus for what lies ahead for Zeus and me. The morning was spent with group placement and warm-up rides which focused on lateral flexion and the correct basics. After lunch, I switched Zeus from a smooth mouth snaffle to a twisted wire. He has a habit of running his nose down at random times throughout a ride and was beginning to get slightly dull to the bridle pressure. He is overall very light. The slightest suggestion with the bridle or cinch was met with soft quiet touch. In the past two weeks, I have noticed him becoming increasingly stiff to the left. The twisted wire made a great difference. Pat worked with my Dad on improving his three-year-old’s back up. Fudsy has a sticky, stiff back-up. Pat had dad tip his horse’s head slightly one direction and softly ask for the back with a voice command and a light pull backward. 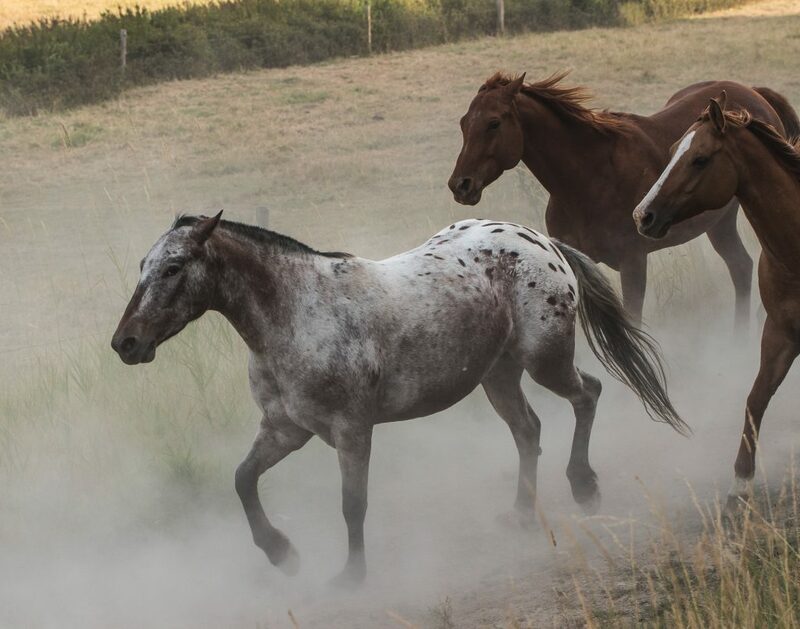 If the horse stiffens and doesn’t step backward, move the leg on the side the horse’s head is tipped toward back near the back cinch and tap with the spur. This excites the horse and will either cause him to take a step back or sideways. Either is met with a release of the reins. Repeat these steps as the horse discovers the ability to back quietly with the soft bridle pressure combined with the leg for excitement. Zeus has a pretty decent back that I was never really worried about improving it but using this method I hardly need to pick up on the reins, add the leg queue and he steps backward quickly and freely. Zeus started out the day with a little less spit and vinegar. The morning ride was an individual workout. Pat continued to try and improve my stop. His goal was to get him to finish each stop better. First, he did this by adding the shake on the end of the stop sooner. This just seemed to make Zeus tense in the stop and begin to hit slightly on the front end. My afternoon individual workout was spent working on same lead roles. The goal of a same lead roll is to make the horse think that they are going to turn at the end of the stop. If their front feet are busy getting ready or trying to turn, they can’t use those front feet to brace and stop. We ended with one really hard front end stop, then a final only decent stop but it was balanced and Zeus was using his hind quarter to stop; not his front end. The next run was better and involved more same lead rolls, and Pat honed in on my hands. The rhythm of a stop should be “whoa, wait, release, check, check, check” (with the checks starting as very soft and increasing in pressure as the horse moves into the stop). My problem (and in turn Zeus’s problem) was that my order was off. I would execute the stop as, “whoa and release (at the same time), wait, check, check, check… Really I knew this in my head but I was not making the conscious decision to make my hands do things in the right order. As soon as I executed my pattern of ques correctly, my stops were magically pretty darn nice. My tired pony got a good rub down and an extra biscuit at the end of the day. I have said for many years that Zeus and I have an intense love/hate relationship. The love and hate swings on a wide pendulum. Sometimes it swings slightly one direction or the other. Other times it swings full and strong to one side or the other. At the moment, the pendulum has swung strongly to the “love” side. He is curious, athletic, and has so much try (even if he does try with his ears pinned back). The morning began with trying to nail down Zeus’stop. Pat had me really running him into each stop to get Zeus to put more effort into his stop. Pat really emphasized the timing of my checking rhythm. When my timing was perfect, the stops were nice. Smooth, balanced and (at least from my perspective) dramatic! But, when my timing was off, or when the set-up was imperfect the stop was rough. The second part of the morning was spent in individual work-outs being videoed. We each entered the ring alone and went through individual instruction by Pat. During lunch, we watched the video footage. 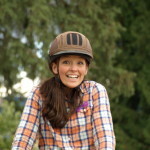 Video is an invaluable tool in the world of horsemanship. Video footage does not lie. You can see on the screen all that you are doing correctly and all that you are doing incorrectly. It is truly eye opening to watch yourself ride for the first time. I was very happy with our video run. Two nice flying lead changes (one flubbed change because of poor planning ahead), a great set of same lead rolls, and mostly nice stops. After lunch, Pat continued to try and focus on Zeus’ stop. More same lead rolls. A same lead roll is an exercise using to intensify a horse’s stop and push him to using his hindquarter (the engine) to stop and not the front end. The theory is, if a horse thinks, as he is going into a stop, that he is going to turn, then he will not stop on the front end. His front feet will be moving, preparing to turn. The exercise is completed by completing a rollback into the lead. Usually, a rollback is executed away from the turn. In a same lead roll you lope down the fence, let’s say in the right lead, stop and roll right into the lead, jumping out again in the right lead. Then lope down the fence, stop and roll into the lead (right) and continue the pattern. Continue this pattern until the horse puts maximum effort into the stop then repeat in the opposite direction. Zeus’ effort in this exercise was good. Not up to his full potential yet, but good. After lunch, we went back to work on the same lead rolls. Results with this exercise for Zeus and I seemed mixed. At times he really got under himself and used his hindquarters to stop. Other times we came into the stop and he would stiffen and stop with his front end. Pat changed his strategy and had me try stopping while using the lead-side rein slightly more. Somewhat favorable results followed. Both he and I were tired at this point so we took a break from stops and moved on. Next, the whole group entered the arena. I had asked Pat to walk me through a spin. As the group gathered on the rails, Pat had me work on my spin. First walking in a small circle then gradually tightening the circle, adding the outside leg and dancing the horse around with a press and release. You cannot force a horse through a spin. You can force one step, but after that, the horse disengages their hind quarter and the turn becomes just a squirm. I was very happy with how Zeus did. We worked in creating a calm, quiet turn on the haunches. Next Pat had me ride Zeus down the center-line counter-flexing left and then right. Next, he had us perform a turn on the fore-hand each direction then ride down the centerline and sidepass right then switch direction and sidepass left. Then, as a group, we all worked on these exercises. Oh, so many things learned! It has been two years since I last took a clinic with Pat. Prior to that, it had been another couple of years since I last rode with Pat. I find that without consistent training of myself, the training of my horse becomes week, lax and lacking direction. This is why, to be a great horseman, you must continually improve yourself; lessons, clinics, expos, mentors, trainers and videoing yourself are vital. I recently read a Facebook post by a horsewoman whom I have never met in person but have read her many wise pieces on horsemanship. She said, “You’re only as cool as your horse is”, and I believe the opposite is also true. #1. I can push my horse more than I have been. I should have higher expectations for Zeus’ performance. He has the athletic ability and the talent to perform at such a higher level than I have been asking him to. #2. Pushing my horse to reach for his highest potential will require the same from me. My timing and feel must be spot on. Pat switched me to the Horse Wyse Hackamore. I was really intimidated by this tool. I am a plain Jane, snaffle and maybe a small curb kind of girl. So, for me to use a hackamore of this complexity was intimidating. The goal was to get Zeus to intensify the stop. At the time I felt like it was really rough. Although looking at video footage it wasn’t near as bad as I thought. So many same lead rolls! When I switched back to the twisted wire snaffle, Zeus made three really nice stops and then kind of went back to not really trying very hard. Zeus never can do anything the easy way! #3. Zeus and I may have a love/hate relationship but I think most of the “hate” side comes from my own shortcomings and insecurities as a leader. When I am confident and not weighed down by my fears, the “love” is really strong and we both have more fun. Continue to work on the spin. I have a good start and I need to keep moving ahead with it. Zeus tends to be stiff and/or resistant to the left. Returning to the basics of getting him lateral will help with this. Work at speed. I rarely work my horses at speed and I am doing them a disfavor by doing so. Keep pushing Zeus to achieve his highest potential. I will work to intensify his stop. By focusing on my timing, rhythm and feel this goal will be more easily achieved. Gradually slow down the flying lead changes. Zeus is a very easy changer so this should be a fairly natural progression for him. Dabble in collected work. I would love to work toward collected lead changes. I have never had a horse with the natural athletic ability to achieve this goal but Zeus could be the horse that really excels in this work. Get out on the trail. Perhaps the area of Zeus’ training which is most lacking is his trail experience. 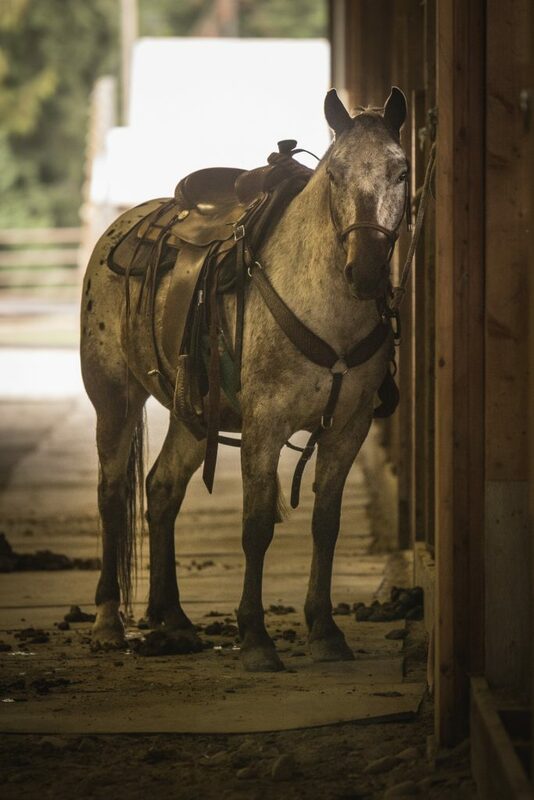 I have spent very little time trail riding this gelding in part because I can keep an eye on my children and ride my horse at the same time in the arena. 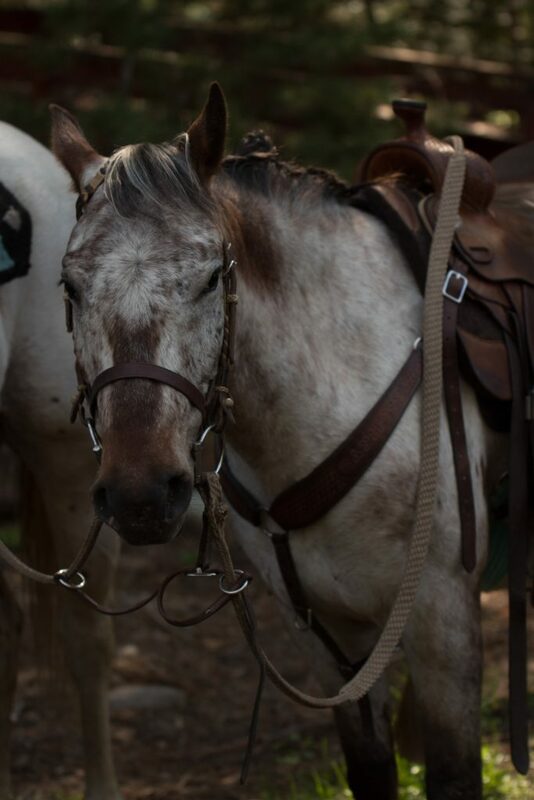 Zeus tends to be reactive outside of the arena on the trails, so trail riding can be less than relaxing on Zeus. 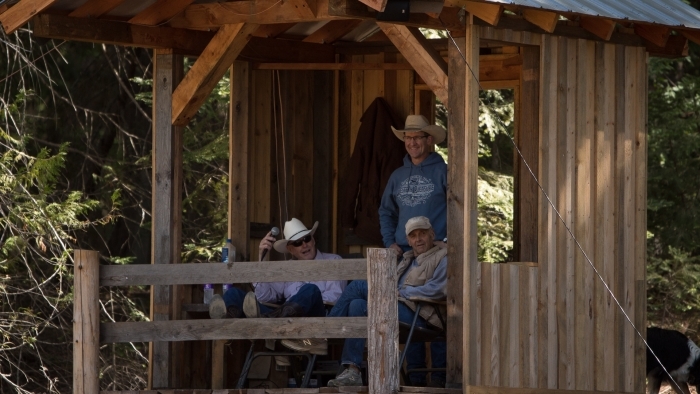 We do a good job here on our ranch of putting a great foundation on our horses. Where we fall short is that we do not take them beyond the “Basic Handle” foundation work. 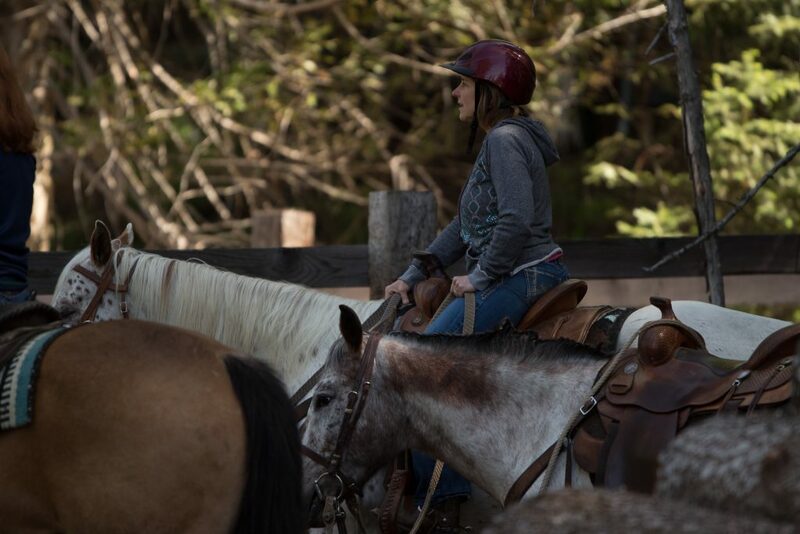 It is time that each of us expand our training potential by taking the time with a horse to go beyond the foundation work and expand our horizons into more advanced maneuvers.